Due to the lack of sufficient in-situ observational data and the length of the simulations carried out with OGSTM-BFM model, necessary to resolve the proper time scales, researchers have to tune the model setup and particularly the boundary conditions (BCs), to which the model is very sensitive. The possibility to explore the model behavior during runtime could be beneficial to control the correctness of the nutrient and carbon cycle estimates and the key ecosystem processes. Obviously, an increase of the spatial and temporal resolution of the simulation, often requested by the CMEMS users, means a longer simulation time, an increase of the memory burden and therefore a difficulty to manage the output, and possibly, the need of an optimal tool to analyze the model state with enough details from the open ocean to the coastal areas. An online (i.e. runtime) 3D visualization tool will be extremely helpful to check the status of the simulation by consistently evaluating how the biogeochemistry (for its key ecosystem dynamics or for some specific biogeochemical variables in selected areas) is affected by the nutrient and carbon cycles specifically related to the BCs: the Atlantic inflow at Gibraltar Strait, the atmospheric deposition, the terrestrial inputs at rivers. We propose to develop a 3D visualization tool that can be used online to check the correctness of the reanalysis but that may be adopted also offline (i.e. for post-processing) to explore the time evolution of the 3D fields of nutrient and carbon, in particular following the biogeochemical signals related to the three main BCs. This task is particularly ambitious due to the strong anisotropy in the dimensional scales of the model volume, e.g. the Mediterranean Sea has a horizontal scale of 4000 km and a vertical scale of 4 km in its maximum depth. Such tool will be designed and implemented to be portable to other coupled modeling systems used at OGS and for different purposes: from the long-term, multi-decadal runs to the operational workflow embedded in the CMEMS infrastructure. As an added value, the tool will be then integrated within the Visual-Lab facility that is planned to become operational at OGS during 2016. Snapshot of daily surface chlorophyll concentration (mg/m3) at 1/16 degree horizontal resolution on the Mediterranean Sea calculated from the OGSTM-BFM model. 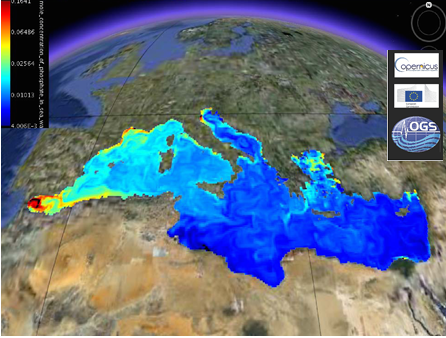 OGSTM-BFM is a coupled physical-biogeochemical model operated by OGS that weekly provides the marine biogeochemical products (analysis, forecasts and reanalysis) of the Copernicus Marine Environment Monitoring Service (CMEMS) catalogue (http://marine.copernicus.eu/web/69-interactive-catalogue.php). Other products are: phytoplankton biomass, phosphate, nitrate, primary production, oxygen, pH and pCO2. The purpose of this project is to integrate a visualization tool within the current OGSTM-BFM model workflow. Our final product will consists into visualization scripts based on ParaView ecosystem ( either CINEMA component for batch visualization or CATALYST for in-situ ) as well as a movie illustrating the use and the results obtained during this 2 months work period. Also a small report on the work done will be produced. A part from the OGSTM-BFM model that is owned by OGS and will be provided in source form under a non-disclosure agreement, all other needed software ( mainly ParaView and Blender ) is released open source and already available on the CINECA clusters that will be used by the students with their own provided accounts.